Andrew Yang’s presence in this race is going to be felt 4 and 8 years from now. He’s a serious threat. In a lot of ways - even more than Bernie or Trump. He has new plans, populist plans, that are well thought out, and well delivered. He emanates competence. And he’s the FIRST person who’s realistic about the future of the labor force. Whether this is the eventual solution is up for debate, but he’s the only one dealing with it. I’ve been talking about this for almost 10 years. The writing has been on the wall for a while, and it was clearly going to wipe out 30+% of our labor force by 2040, and no low skill jobs will be there to replace it. We already have 10-15% of the population who are virtually unemployable due to a lack of intelligence, and that threshold is about to jump to 40+% in the next 20 years. He’s also one of the rare ones who understands the prison cycle, and the fundamental problems with poverty - isolated from the toxic culture that often spurred it to begin with. He’s too brainy and lacks charisma to get the nomination, but he’s going to notch up 5-7% support in the polls and make debates. He’ll also probably end up with an internet army to boot. 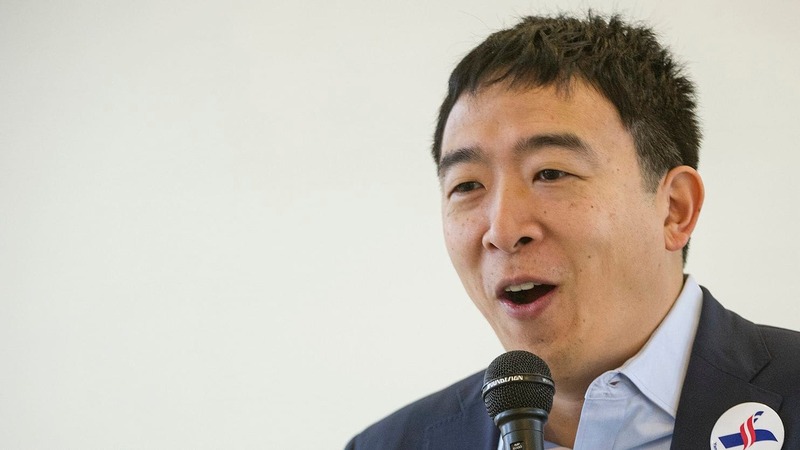 He won’t get the nomination, but just as you saw Ron Paul’s anti-war spearhead make it possible for Trump to even exist in 2016, Yang is paving the way for a new era in the Democratic party. I’ll look at his stuff but he ain’t making the debates this time around. Ron Paul and Bernie both had some sort of name recognition to start with. If he gets any traction he’ll be character assassinated, at least, or just plain ol’ murdered by an establishment that wants nothing to do with “ideas” or “plans” or “policies” that do not benefit them and their benefactors and cronies. You think they learned nothing from the Trump phenomenon? EDIT: “Establishment” has nothing to do with party, either. Hang 'em all. The DNC set a threshold of 65,000 donors or > 1% in 3 major national polls to appear in the first two debates in June. He’s at 1% in polls, but already cleared the donor requirement. If he gets any traction he’ll be character assassinated, at least, or just plain ol’ murdered by an establishment that wants nothing to do with “ideas” or “plans” or “policies” that do not benefit them and their benefactors and cronies. 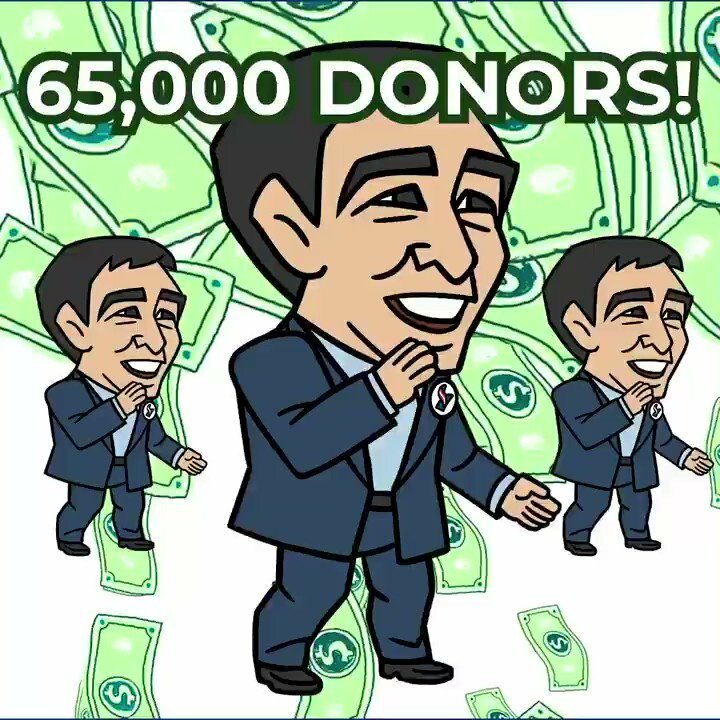 Yang announced Monday that he surpassed 65,000 donors, the Democratic National Committee’s threshold for participants in the first two debates. much of his platform would be at home on the wish lists of die-hard liberals — a fact that makes his sudden support among the alt-right even stranger. An article on The Verge documented Yang’s meme-fueled rise to ironic hero status among the 4chan set of the fringe right wing and the all-out white supremacists, as both groups have projected their views onto an obscure candidate. He’s a White supremacist Neo Nazi! He emanates competence. And he’s the FIRST person who’s realistic about the future of the labor force. I don’t think so; as someone who drives trucks and has coworkers who work short hauls, I see him straining to overlook the thing undermining his point. Long distance trucking will be automated; short-haul won’t be any time soon as it’s far less routine. Thus, all the truckers in long haul will move to short haul overtime. Thus, as he points out, you get better fleet utilization, and the cost of shipping overall drops. Thus, short-haul trucking grows tremendously in volume. If the number of truckers don’t increase (he himself says they’re not), their pay continues to climb, with plenty of work for them to do. Thus this just becomes a repeat of what we saw happen with ATMs and bank tellers; one task is taken away from a worker, but it grows out opportunities for the rest of what that worker does/can do. It’s a displacement, not a replacement. A distinction I believe they also make, or at least try to. Long-haul trucking won’t be totally automated anytime in OUR lifetimes…nor probably in our kids’ lifetimes. It would require MASSIVE reworking of our highway infrastructure and there is simply no push to do this and spend that much of our scarce resources. We already have robotic trucks; you tell them to go to a depot/warehouse close to the highways, short hauls do everything else. There are no commercially operated automated big rigs on United States highways and there will never be on a significant scale; there will be test programs and the results will be catastrophic. I wouldn’t bet against it. I don’t know why anyone thinks automated road vehicles are a good idea. It’s just another way to create new problems, make people more dependent on society, and isolate people for needs best met by other people rather than machines. I wouldn’t bet against it. I don’t know why anyone thinks automated road vehicles are a good idea. Human beings have limits for how long they can drive; by law we set these limits as 14 hours, then you need 10.5 for yourself before you start another shift. Machines can keep going till the truck breaks down. In the military, Reaper drones provide more consistent air cover than manned platform. Similarly, a drone truck can keep feeding warehouses nonstop. No need for turnover. No need for training. No need for rest stops. Just maintenance, oil and fuel. The net result will be cheaper, quicker shipping. Until one of the drone trucks kills a kid it didn’t recognize as a hazard, that is. Then it becomes VERY expensive. The the end game is still a long time coming. Eventually, the only people whose job are safe from robotics and computerization will be Preachers, Politicians and Prostitutes. If anyone can add to the list please do. Tell me, how do you automate a plumbers job? Or a mechanics? While I’m sure some work they do is something you could write up as a cookbook of algorithms, I’ll bet that most isn’t. Automation goes after jobs that are routine and costly. It happens according to that formula. Where it doesn’t make sense, it doesn’t happen. More often you’ll find technology De-skilling instead. Which itself creates more jobs. Maybe you missed this part of my sentence: " long time coming". Plumbers: A fully articulating humanoid robot filled with encyclopedic knowledge of plumbing and access to youtube DIY videos. Could easily be 50 or 100 years down the road. Next “absolutely unreplaceable human being”? That isn’t enough. You can’t fix a plumbing issue with an encyclopedia of plumbing issues; there are skills that the encyclopedia will not alone allow you to exhibit. And if the problem isn’t presenting in a way the encyclopedia predicts, an AI won’t even recognize what the problem is. It’s for the same reason that reverse-engineering is becoming less and less useful of a means of keeping pace with rivals; there’s descriptive, tactile knowledge that a blueprint will not convey; it’s embodied in the experience of the people who have it. DIY videos are frustratingly non-descriptive. You need deductive reasoning to figure out how what they’re doing applies to what you’re doing, when tools, their tolerances, and the direct cause of a problem can vary wildly. You also need to deduce the problem in as few tries as possible; many things will not allow you to brute force your way to a solution before you permanently damage whatever it is you’re working on. What you’ve outlined may work as a way to de-skill plumbing; there are tasks machines could be deployed at that make human experience less necessary, but it can’t replace them. Not without AI achieving something like consciousness. Which is significantly different from what we’ve gotten AI to do up till now. Cost. If it’s too costly to develop a mechanized replacement, businesses won’t do it. Possible does /= practical. This can’t be forgotten. It’s possible for us right now to achieve the Alchemedic miracle of turning lead to into gold. We don’t do this, because it’s not worth it. The way you envision automation is committing the same error that California did in envisioning high speed rail. Or much of the population in envisioning flying cars. Cost-benefit analysis is not something businesses skip over idly. Human operated big rigs are involved in accidents with 4,000 deaths every year. I think politicians would be the easiest to automate. Just use a bobblehead doll that operates on campaign contributions. You can’t fix a plumbing issue with an encyclopedia of plumbing issues; there are skills that the encyclopedia will not alone allow you to exhibit. And if the problem isn’t presenting in a way the encyclopedia predicts, an AI won’t even recognize what the problem is. If nothing else, you could send out Plumbertron 9000 for the initial attempt. And if it fails to diagnose/fix the issue, send a human. The majority of plumbing issues are ordinary and predictable. I think making a pretty good diagnostic plumber replacement would work. The issue is much less on the intelligence side, and much more on the execution side. You’d need a machine that is fully mobile, can fit and bend and twist in tons of angles to remove and replace pipes, and be able to to carry heavy weight as well. And it would have to be able to either get itself on-site, or at least navigate there from its transportation point. All of those reasons make it highly impractical. I think AS should invest heavily in the entities that are developing self driving trucks, since he seems to once again be an expert on an industry that he knows absolutely nothing about beyond hearsay. That would be “putting your money where your mouth is” after all. I drive trucks RET. I’m DoT certified. I don’t do long haul, but this is adjacent to my ball park. I have coworkers in it. 14-10.5 rule is something I know, because I live with it.